Americans Scott Lipsky and Rajeev Ram defeated Rohan Bopanna (IND) and Kristof Vliegen (BEL) 6-3, 6-7(4), [12-10] to win the Atlanta Tennis Championships doubles title. After winning the first set 6-3, Lipsky and Ram dropped the second losing in a tiebreak 7-4. The third set was decided by a 10 point tiebreak, which Lipsky and Ram initially led 5-1. However, Bopanna and Vliegen battled all the way back and had the first match point at 9-8. Lipsky returned a backhand down the line to save matchpoint and four points later he and Ram won the title. 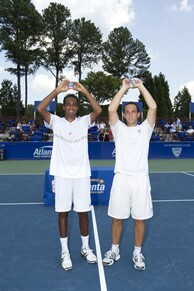 The Atlanta Tennis Championships doubles title is Lipsky's third ATP World Tour doubles title and Ram's fourth in five finals.